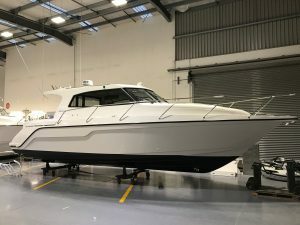 The astonishing popularity of the new Rayglass Legend 3500 has resulted in the company adding a new production facility to get more boats on the water, faster. “Understandably, our owners want to be able to enjoy their new 3500s just as soon as they possibly can,” says Rayglass Boats Sales Director Scott Little. A Rayglass 3500 nearing completion. A sophisticated modern take on the much loved traditional Kiwi sedan cruiser, the new Rayglass 3500 has proved to have a very wide appeal since its launch earlier this year. Unique production techniques, especially developed by Rayglass for the 3500, have enabled Rayglass to include many features usually found only on much larger vessels. These include an aft galley capable of servicing both the large saloon and those in the cockpit; a U-shaped lounge with great all round visibility, an island transom with functional seating, barbecue and live bait tank; a large open cockpit with big duckboard; and a comfortable foredeck sun lounger, with recessed drink holders. There are also spacious master and guest cabins and separate shower and toilet areas — and Rayglass’s trademark stylish good looks. Another new Rayglass 3500 nears completion for its new owner. Based on the water’s edge in Auckland, New Zealand, Rayglass today employs over 60 people in four state of the art manufacturing facilities and is one of New Zealand’s most successful marine businesses, both at home and internationally. In addition to the multi award winning Legend series of GRP powerboats, the company also manufactures internationally renowned Protector range of patrol, work and pleasure RIBs and the highly innovative Pro Jet (the world’s first commercially manufactured PWC powered RIB).